Valentine's Day will be here before we know it. 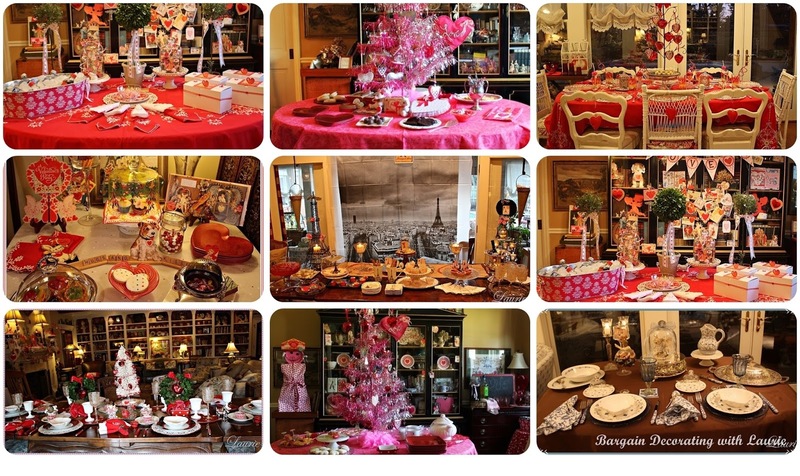 I'm sharing some of my previous years' tablescapes during the season of "luv". In 2013, I hosted a box lunch for a Valentine celebration. What could be more romantic that a night in Paris? A little dessert table in 2011. A Valentine box lunch in 2011. I called this Valentine tablescape "Where's the Red". I hope you got some inspiration for your own Valentine's tablescape. Thank you for reading BDwL. This post is partying with Tablescape Thursday at Between Naps on the Porch and Talk of the Town at Knick of Time. We hosted our youngest grands last year with a treat making party before Valentine's... I'm looking for ways to provide fun in a non-breakable environment (laugh) for them again! You've giving me some great ideas... I have a friend, a forever friend and her Birthday is February 14th. I'm thinking of a little surprise party. All the post are wonderful. You are so creative. wishing you a terrific weekend.